As we’ve progressed through this series on ‘identity’, we’ve turned increasingly towards the concept of ‘Christian identity’. 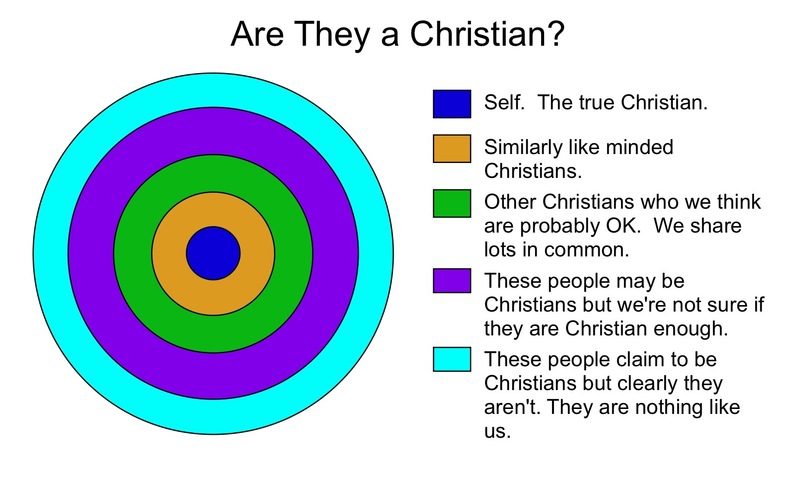 How do we view ourselves as ‘Christians’ within a Christian community? As Christians, the world is viewed in light of our relationship with God. This naturally affects the relationship people have with other people who also have a relationship with God. Relationship is at the heart of Christian identity. Our identity is formed through the way we relate to God through Christ. When the first Christians described themselves as ‘followers of the way’ their identity was firmly routed in their ongoing journey with Christ. That was the way in which they identified themselves. It was others from outside who originally called those first followers ‘Christians’. I use this to illustrate the deeply personal nature of the Christian faith. It is centred around a relationship with God and an ongoing task; take up your cross and follow me. Over the past few days I’ve mentioned the existential crisis for every ‘goth’: what if I’m not goth enough? It is also at the heart of many followers of the way. What if I’m not a very good Christian? If I am honest, I have those doubts most days. I’m still awaiting the day when the diocese send someone round to my house. They will knock on my door, come into my office, go to the filing cabinet, take my holy orders and inform me that a mistake was made four years ago. “Sorry mate, you’re just not a very good Christian”. I think this is at the heart of Doctor Ruth’s post on Saturday about imitating Christ: we are called to be Christlike, we are not called to be Christ. Experience is a key component of our Christian identity. When someone is certain of their faith, it can be a benchmark that others will be unconsciously compared to. When someone’s experience of God bears little relation to our experience of God we can either question our experience or theirs. As the diagram illustrates, the way we relate to others often leads to tribalism. I think a circle for those who might not profess to be Christian but seem to be doing the right thing, those who might not have said Lord, Lord but who follow their heart and do the right thing… ::Shrugs:: I think that such a circle would perhaps be the most interesting and mysterious? Mistake: I had put the bible verses in numerical order and then decided to swap the order and then got the insertion of the ‘and’ wrong, sorry! I meant Matthew 21:29-32 and 7:21-23. And I don’t think it’d be my drawers and cupboards that I’d have trouble with someone rifling through to check my Good Christian Credentials, it’d be my head. Gulp again. Anyway, yeah, good stuff, and yay for grace and second chances. Robb, I don’t disagree with your fundamental premis in this series, but how does one negotiate the path between the ‘deploring tribalism’/resisting the ‘they’re not-christian’ judgemental modus you indicate here and standing against that which we DO deem to be perversions of the Gospel and which we do NOT wish others to associate with Christianity? I tend to say ‘well it’s not what I understand Christianity/the Gospel/the Way to be about’ – but the implicit subtext is ‘I don’t recognise the people expressing these views/carrying out these actions as being ‘Christian’ (in the way that I am)’. I don’t know. Probably by recognising that we are also in that category. I was going to do another post after this but I’m stretched. It was going to be an epic Venn Diagram.